As many of you know, I married my best friend on September 24, 2016. I promised you all that I would tell you how I incorporated cows into our wedding and I’m finally getting around to telling you!! So, are you ready? 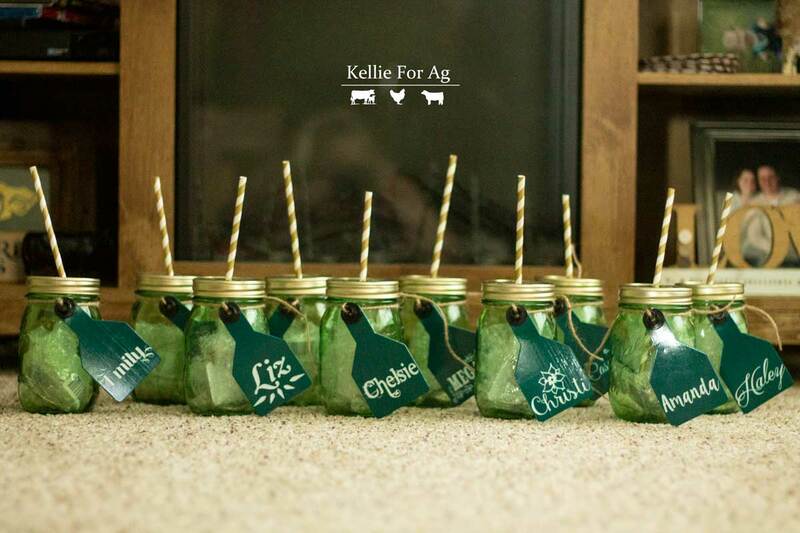 Here is how I put cows in my wedding, but kept it classy! First of all, the girls in my wedding needed to be cow-approved. As one of their gifts they received a cow tag that was uniquely designed with their name on it. I tied it to their mason jar drinking glass so they could keep them all separate, but then at the end of the wedding they had a cool new key chain! Then there was our cake!!!! We couldn’t get possibly get anything traditional there. I think this summed us up pretty well! I added cows to the guys boutineeres. This was a surprise for the Farmer and one that he actually thought was pretty cool! Of course, I had to get everyone a different breed to match their liking. The Farmer’s family all got an Angus, Dad got a Shorthorn, my brother-in-law got a Hereford, and two of the Farmer’s friends got a Hereford and a Shorthorn. I, of course, had a Hereford in my bouquet. Our card box was the shape of cows. One side was Angus, one side was Shorthorn. They lady who made it for us actually did something rather cool for me, she had a good friend of hers paint the box and asked me if I had a specific cow that I wanted for the Shorthorn. I did! I told her I wanted Grandma Hershey! She was my first cow and I’ve always been obsessed with her markings. So, the painter did an amazing job of depicting her markings and even made one roan spot a heart! It’s absolutely perfect! I wanted cupcakes for the wedding because they’re my absolute favorite dessert! So, I asked and I received. To insert my love of cows, I purchased some cow shaped sprinkles–they were even black, brown, and white! So perfect!! Even though I wanted some very delicate and fancy looking invites, I still had to incorporate my mommas. So I designed some stickers to hold the belly band together around the invites. I got the most compliments on this! I bought a Cricket and made all the signs for the wedding. Well, thanks to Cricket, I was able to add little cows to each of my signs! In Iowa, it is common to make koozies as your party favors. So, we didn’t stray too far from the usual, but I was still able to get those cows on there! One side of the koozie said, “Let’s Party ‘Til the Cows Come Home!” with a little image of a cow. I didn’t have anything huge, like an ice sculpture of a cow (would have if I had the money!! ), but I made sure that everyone knew that the Farmer and I love our cows and they’re as much as a part of our lives as anything else!! It was so fun to incorporate something we both love so much into our wedding day. Awww, such sweet photos! Love the cow theme. Thanks for sharing! Ha. My name is Kelly, from Iowa, and also refer to my husband as “The Farmer!” My hashtag was “farmertakesawife2015”. Love the hashtag! 🙂 We do have a pretty great name!